From the pen of Bonnie Bright. Perhaps one of the most profound difficulties of our time at this moment is the challenge to make meaning. When troubles ail us and the world seems to be on the verge of falling apart, recovery of meaning in our personal lives requires a recovery of the sacred, and a recovery of the sacred necessitates a recovery of ourselves and an understanding and communion with the depths of our own being. 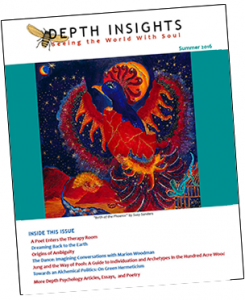 With the launch of this issue of Depth Insights, I am inclined to reflect on our now five-year history of publication. Over the years, we have received an impressive collection of depth-psychology-based articles, essays, poems as well as fantastic art that so powerfully illustrate how depth psychology can enhance the lives of those who engage with information and practices aimed at accessing the unconscious. When we begin to understand the symbols and messages that come through from the unconscious to help orient and guide us in daily life, these insights help us make meaning. This issue contains a particularly eclectic mix of topics, ranging from the value of poetry, to philosophy, to dreams, and embodied understanding. To begin, Jungian analyst Susan Schwartz offers a compelling argument for how some of her therapy clients have related to the poetry and journals of Sylvia Plath, who translates private hurts into public images.  Ecotherapist Mary Kay Kasper writes about how dreams not only speak to the story of who we are,  and how we engage the world, but also speak to the collective experience that is the Earth’s dream, revealing parallels between the individual soul and the soul of the Earth. Maggie Hippman, M.A., contemplates the evolution of language as it has shifted from being used to engage with outer phenomena to a role of being used to express the inner phenomenon of thoughts, emotions and concepts. She reflects on how alchemy, archetypal psychology, and imagination come into play in the evolution of language, while returning contributor, Gerald Kegler, M.Ed., assesses five verses from the biblical book, Jeremiah, which Jung also expounded on in The Red Book, and draws conclusions about prophetic roles of both Jeremiah and Jung. Megan Popovich, Ph.D., makes a creative contribution representing some of renowned Jungian analyst Marion Woodman’s best work through Popovich’s The Dance,  in which she envisions a conversation with the legendary Woodman. Psychotherapist Lisa Schouw, who has a particular interest in the part creativity plays in the individuation process, offers an engaging look at how the tales of Winnie the Pooh, who has been studied by neuroscientists, literary critics, psychologists, Taoists, and even ecologists since his creation by Milne in 1926, connect us to Jung’s individuation process. Two thoughtful works on philosophy and depth psychology round out our essays for this issue. Anthropologist Jonathan Marshall writes about the relationship and difference between alchemy and those strands of esoteric philosophy known as hermeticism, with the aim of discovering the insights these philosophies may have for our political and ecological life, and Andrew Carnahan, whose academic interests include Humanistic approaches to addiction treatment, shares an enlightening essay on how hermeneutic understanding applied to depth psychology reveals how both symptoms and symbols offer important information for the exploration of concealed meanings shaping one’s life. Book reviews from Catherine Svehla and Dennis Patrick Slattery present wonderful opportunities to expand your horizons through new and relevant publications, with Svehla’s assessment of Nora L. Jamieson’s Deranged, an extended meditation on the conscious experience of collective fragmentation and the power of memory to heal it, and Slattery’s review of Edward Tick’s Warrior’s Return, which focuses on healing the warrior’s spirit after war. Now, at the five-year the anniversary of Depth Insights, I invite you to take advantage of these works not only in this issue, but in past issues as well. All efforts have truly been a labor of love on the part of both the volunteer editorial team, as well as the authors, poets, and artists who have contributed over the years. Wishing you, in small part through Depth Insights, the greatest of gifts: to find meaning in your life and work.